PHILADELPHIA – Drugs that target BRAF and MEK in cancer have shown promise in treating a subset of melanoma that carries a mutation in the BRAF gene, but drug resistance usually emerges, reversing the benefit of these drugs and limiting the survival of patients. Research has shown tumors have two common ways of resisting this approach. Until now, those resistance mechanisms were thought to be separate, but a new study from the Abramson Cancer Center at the University of Pennsylvania is the first to show they’re actually connected by a newly-identified process called ER translocation–where the first mechanism leads to a chain reaction that activates the second. Further, since drugs already exist that can block some of the steps of ER translocation, this finding potentially opens the door for new approaches to overcome resistance to treatment. Researchers published their findings in Cancer Discovery today. BRAF mutations occur in a genetic pathway known as MAPK, and they are known to drive tumor growth in melanoma. This mutation is commonly targeted with a combination of BRAF inhibitors, as well as drugs called MEK inhibitors. These block ERK, which is an important protein in the MAPK pathway. The combination has led to higher response rates in melanoma, but resistance is common. The first common mechanism of resistance is that ERK finds a way to reactivate itself, getting around the intended impact of the inhibitor. The second common resistance mechanism is called autophagy – a process by which cancer cells recycle their own parts to survive. “In this study, we not only identified how ERK reactivates, but also that it’s this reactivation which actually increases autophagy,” said the study’s senior author Ravi K. Amaravadi, MD, an associate professor of Hematology-Oncology in Penn’s Perelman School of Medicine and co-leader of the Cancer Therapeutics Program in the Abramson Cancer Center. Researchers found that when melanoma cells are exposed to BRAF and MEK inhibitors, proteins in the MAPK pathway – including ERK – move from a part of the cell called the cytoplasm to another called the endosplasmic reticulum (ER). The researchers call this movement, “ER translocation,” and they found that it was required for ERK reactivation, which then increases autophagy. 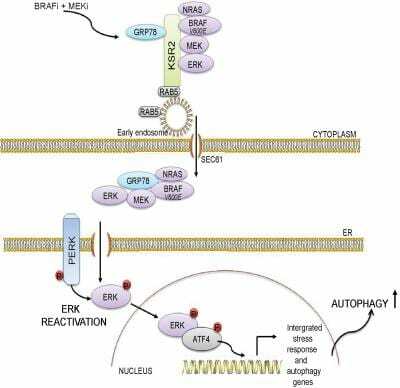 This work therefore ties together the two most common mechanisms of resistance to these treatments, ERK reactivation and autophagy, into one unified pathway controlled by ER translocation. “To our knowledge, this is the first time anyone has shown that ER translocation of the MAPK proteins is a regulated process that leads to drug resistance, which is a major conceptual advance for the field,” said the study’s lead author Rani Ojha, PhD, a postdoctoral researcher in Amaravadi’s lab. The researchers point out that since targeted therapies already exist to inhibit individual elements of that regulated process that controls ER translocation, it may be possible to develop a combination therapy capable of blocking both ERK reactivation and autophagy, thereby benefiting more patients. Constantinos Koumenis, PhD, the Richard H. Chamberlain Professor of Oncology Research and associate director of Translation Research in the Abramson Cancer Center, and his lab contributed significantly to this work. This work was supported by grants from the National Institutes of Health (R01CA169134, P01 CA114046, P01 CA165997, P30 CA016520, SPORE P50 CA174523, R01CA198015).